Knives like the CHROMA JAPANCHEF are standard for chefs of Japanese restaurants. The affordable price/performance ratio makes the CHROMA JAPANCHEF very attractive to those just entering the job market. The price is low and the performance, top. 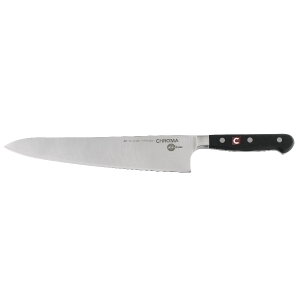 The CHROMA JAPANCHEF affordable, ice-hardened HRC 58° steel blade, ground to sharp perfection. The Japanese geometric blade, ground to a “V” shape, makes the knives very sharp. The CHROMA JAPANCHEF is made by a Taiwanese-run factory in China. A product worth keeping an eye on, and are simple and fast to sharpen using a CHROMA sharpening stone. An ideal knife, and not just for beginning professionals. JAPANCHEF – high quality “no frills” low price knife – CHROMA JAPANCHEF used by professionals in the restaurants. JAPANCHEF is made of quality ice hardened steel, traditionally forged and sharpened with the typical Japanese “V” edge. You can sharpen your JAPANCHEF with a whetstone. JAPANCHEF is a practical knife priced right. JAPANCHEF like any quality knife should never be placed in the dishwasher.